One notably strange difference in the Chinese food in Costa Rica (besides most of it being crap), is that they are likely to serve French fries in the dish or on top. So, don’t be surprised when your chicken curry has a few mixed in and some of the other dishes have 5 or 6 fries thrown on top. I haven’t asked the reason or background on this, but it can’t be a Chinese custom. It’s strangely delicious, so don’t let it throw you off. 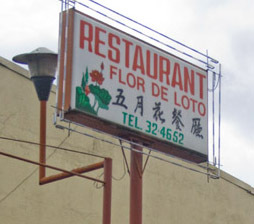 Since living in San Jose, Costa Rica and working in the Sabana area, the Flor de Loto Chinese restaurant just South of the Subway in Sabana Norte has quickly become a company favorite. The front of the building isn’t much to look at, with its dingy sign and lack of parking, but it’s what’s inside that counts. Upon walking in you’ll notice the ornately textured ceilings, pleasant wait staff and amazing food. I haven’t quite figured out why you are given behemoth-sized rolls to start the meal and a teeny-tiny spot of butter to go with it, but all you need to do is ask for the ‘salsa picante’ and they’ll bring an unforgettable oil and chili pepper mixture that is great with the bread and all your food. I always start with the ‘Chinese Tacos’, which are essentially egg rolls. Again, great with salsa picante to mix with the sweet and sour sauce that comes with them. Next up, I recommend the chicken curry or any of the noodle/rice dishes, but I have been advised to stay away from the ‘crispy rice’. I was told it is much like Rice Krispies, so if you’re up for an adventure, go for it. But I consider yourself warned. On the occasion of wanting light fare, I have also had the wanton soup thinking it would be less of a meal, but it was hardly that. They give you a very healthy portion and the flavor is amazing. So, if you’re thinking soup first and then a main dish, maybe find someone you don’t mind sharing with. The prices are fair. Certainly not cheap on the Tico scale, but you can get lunch with a Coke or a lemonade for about $7-10 per person. Flor de Loto definitely leaves you wanting to come back, and I often do. Especially as I have visited other Chinese places that left a lot to be desired (eg. Mil Sabores, or as my husband and I call it, Nil Sabores) and the prices were around the same. It’s worth the trip into Sabana if you are staying at the airport or living in Escazú.